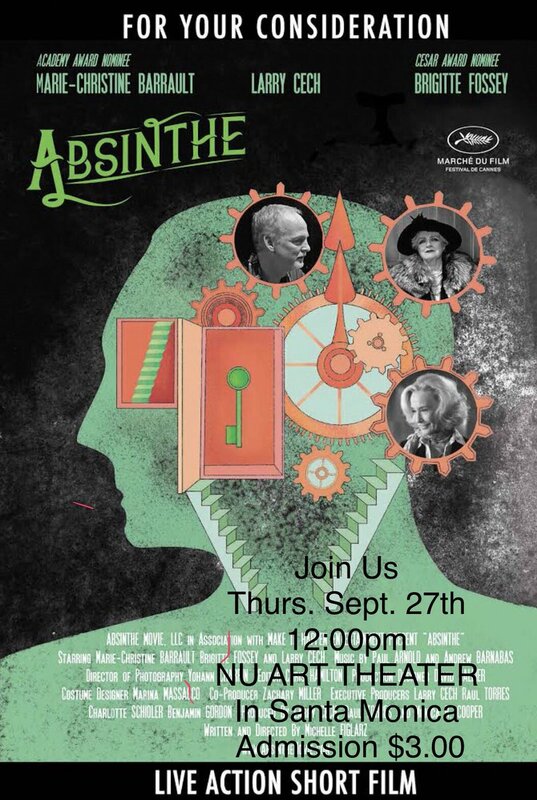 We caught up with the talented producer and actor Larry Cech about his special film Absinthe. Absinthe plays homage to the beautiful black and white old Hollywood stories and shares actual quotes from legends including James Brown, Janis Joplin, Frida Khalo and Marilyn Monroe. This avant-garde film stars two of France’s most beloved actresses Oscar-nominee Marie-Christine Barrault and Cesar-nominee Brigitte Fossey, as well as American actor Larry Cech. The film was directed by Michelle Figlarz and produced by Larry Cech, Raul Torres and Monica Cooper. Absinthe shares the story of Simon, a spiritually lost man, who struggles to live in the past or move forward with his dream of re-igniting his long buried artistic passions. This imaginative piece is shot in color and black & white and is influenced by the work of the famed 1930’s French photographer Brassaï, who was known as “The Eye of Paris”. Larry Cech produced and starred in Absinthe. This talented actor’s previous credits include Washington Blvd., which screened at The Marche du Film at the 67th Festival du Cannes. Alongside Larry, stars Brigette Fossey (Cinema Paradiso) and Marie-Christine Barrault (Cousin Cousine). Also appearing in the film is Raul Torres (Wonderstruck). What sparked the initial idea for this short? After the 2015 Cannes Film Festival I went to Paris for a few post- festival meetings. On a rainy day while I was in my hotel I called the writer/director Michelle Figlarz about an idea I had for a short film where an American business man is at The Eiffel Tower and is visited by three angels. We worked on the initial idea for several months and the script was then completed in late summer. Absinthe has an air of mystery and a history with many famous artists from the early part of the 1900’s. Toulouse Lautrec was a frequent user as well as Ernest Hemingway, Pablo Picasso and Marcel Proust. I am sure it inspired their incredible creativity. A character based on Toulouse Lautrec also appears in our film. I met Marie-Christine and Brigitte at the Festival Sacrè de la Beautè during the 2014 Cannes Film Festival. Marie-Christine suggested that I write a part for her one day. They are both such legends in France and their body of work is just incredible. Marie- Christine was nominated for Cousin-Cousine and Brigitte has worked with everyone from Francois Truffault to Paul Newman. Was it difficult to get Oscar-nominee Marie-Christine Barrault and Cesar-nominee Brigitte Fossey to be a part of your film? They were both interested from the start. Brigitte was a part of the creative process for her character and brought a lot to the table in terms of character development and flow. Marie-Christine and Brigitte are constantly working and we were lucky that they had the time their schedule for us. Referring to the previous question, what was it about Marie Christine and Brigitte that made you want to cast them? Brigitte has a radiance about her that is almost angelic. She emotes so much love for her grandson in the film that it literally pours off the screen. As for Marie-Christine, she brought an impeccable sense of comedic timing. She also had no problem with the heavy period make-up and costume that we put her in. She plays Madame Bijou that was as a favorite subject of the 1930’s French photographer Brassai. Who would your dream cast be? For this film, I think we were blessed with this cast. For our next film we will continue to use some of the actresses from Europe and America whose beauty and talent are timeless. Sophia Loren, Helen Mirren, Judi Dench are just a few of them that are on our list. If you have to give some advice for someone who wants to crack the film industry and/or go into the film business, what would it be? Persist, Persist, Persist. An acting teacher once told me that “persistence trumps talent” all the time. I have never forgotten that. Also surround yourself with positive uplifting people. We are the sum total of the five people we surround ourselves with most. Make sure those five count! What other projects are coming up for you? My producing partner and fellow actor, Raul Torres (Wonderstruck) have a time travel thriller called Entanglement that will be shot in the cantons of Switzerland and a drama entitled The Border that tells the story of two guards on either side of the US/ Mexican border. It’s timely and just a bit political. What are the next steps for Absinthe? We are in the process of gaining distribution and have interest in developing it into a feature film. Lastly, where can people see Absinthe? Right now since we are still in festival mode so it is not yet available to the public. Please follow us on Facebook @Official:Absinthe or Instagram @AbsintheMovie for more details. You can also connect with us @LarryCech and @RaulTorresActor on Facebook and Instagram.